Watch out! There’s a WhatsApp account thief about! 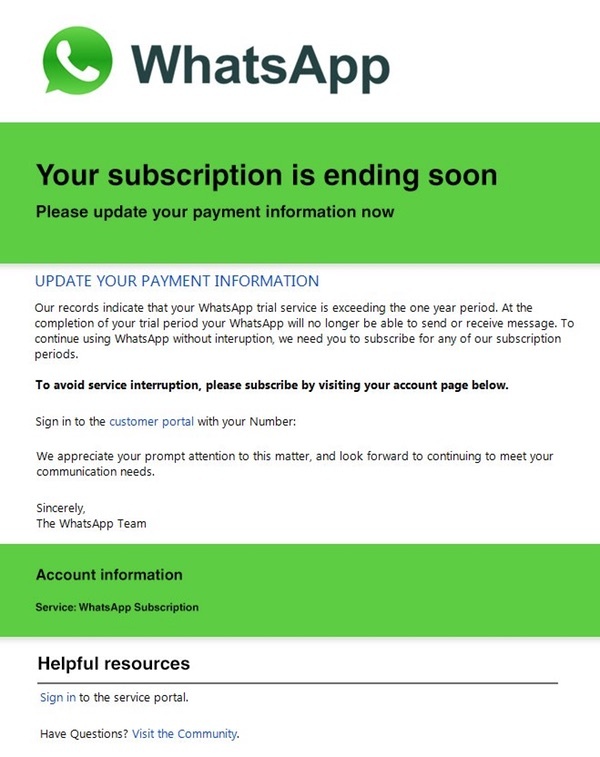 Have you received an email claiming to come from WhatsApp that warns that you have been using the service for more than one year and that it’s time to take out a subscription? Beware! The emails are, of course, a scam designed to trick you into clicking links that might result in you handing your payment information over to fraudsters. What makes the scam somewhat more convincing is that in the past WhatsApp did use to ask users to pay a fee after they had been using the service for over a year. But that all stopped in January 2016, when WhatsApp announced that it would no longer charge a fee, and was making its app completely free for everybody. 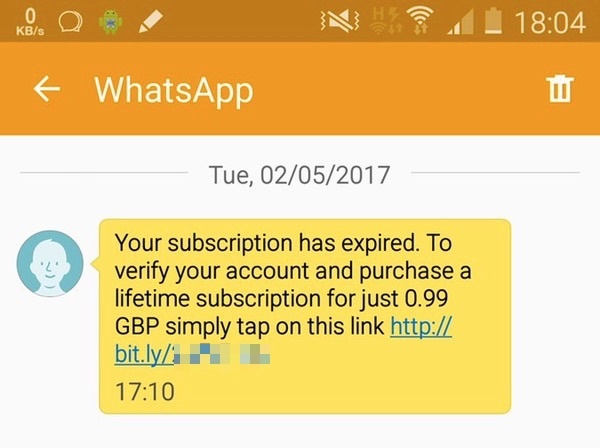 So, don’t be duped into clicking on suspicious links claiming to come from WhatsApp suggesting you need to pay your subscription to continue to use the app. It’s not just nonsense, it’s potentially dangerous nonsense that could leave a hole in your wallet. And while we’re on the subject, as others have previously warned, you should always be wary of unsolicited SMS text messages claiming to come from WhatsApp demanding that you verify your account and buy a WhatsApp subscription.